Emma and Andrew Rutherford weren’t sure cruising was for them. 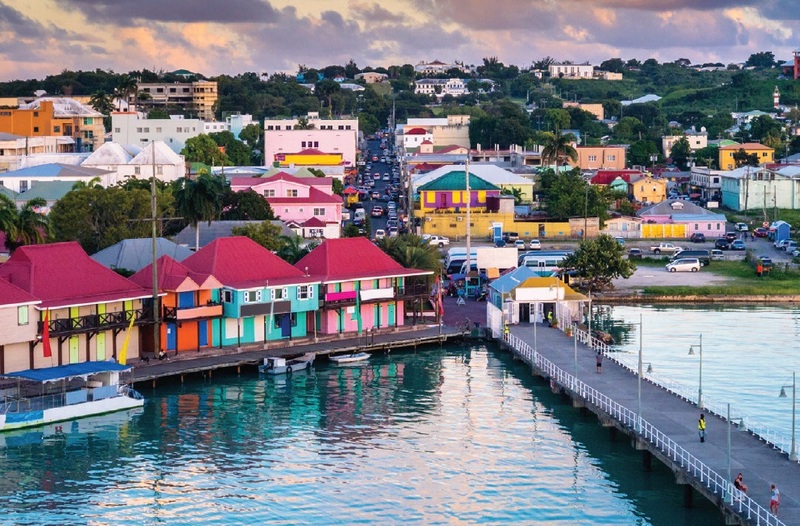 Would ten days in the Caribbean change their minds? When I told my friends we were going cruising, those who’d tried it said: “You’ll love it!”. Those who hadn’t said: “But you’re too young!”. Andrew and I are in our mid-fifties, and I was secretly afraid that the doom-mongers had a point. I imagined being herded onto a coach with thousands of beige, elasticated-waisted pensioners, and being stuck with the same dreary company every mealtime. 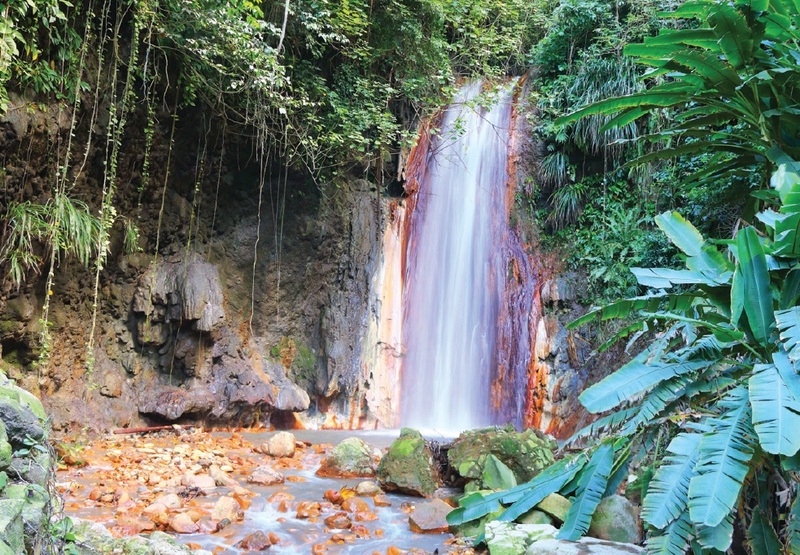 But hey, it was the Caribbean, so in a (youthful) spirit of adventure, we gave it a go. A great start. As soon as we’re through the arrivals gate at Miami we’re enveloped in the Oceania bubble and whisked by minibus to the Marriott hotel, where our lovely room overlooks the harbour. But the night is young so we hit the town, ending up at Bayside Market Place where the band is rocking, the beer is cold and the shrimps are more like lobsters. Queuing for embarkation gives a first impression of our fellow passengers – and it’s not good. This looks more like a pilgrimage to Lourdes as the elderly and infirm totter along, Zimmer frames and all. But no need to panic – we are not the only youngsters. Things look brighter still as we step aboard our ship, Riviera. There’s a string quartet, a sweeping staircase, Lalique glass, artwork everywhere, and friendly staff to greet us. Riviera’s 1,250 passengers are looked after by no fewer than 800 crew, all of whom introduce themselves by name and nationality (“Hi, my name is Selina and I’m from Serbia!”). Another pleasant surprise awaits in our cabin… sorry, stateroom. It is spacious (282 sq ft, apparently), and has a genuine five-star feel. Our cases have been spirited aboard ahead of us, and there’s loads of storage space for their contents. There is a shower and a bath in the polished granite bathroom, with heaps of fluffy white towels and Bulgari toiletries. We have a sofa and a coffee table, a huge flat-screen TV and a private veranda. We’re still taking all this in when Maurice, our steward, pops in to introduce himself and ask if there’s anything we need (aside from his twice-daily visits to tidy, clean, make the beds, turn them down again and leave chocolates on our pillows). We’d been advised to lose no time in reserving a table at each of the four speciality restaurants – Toscana (Italian), Polo Grill (steakhouse), Red Ginger (Thai) and Chez Jacques (French) – as they quickly get booked up. So that’s what we do. Standing in the queue we get chatting to Monica and Ed from London, who we immediately warm to. We’re all delighted to discover that there’s no extra charge for the speciality restaurants, as all food and soft drinks are included in our fare. Alcoholic drinks must be paid for, but each passenger is given a credit card on embarkation, so no cash changes hands (your card is also swiped every time you get on and off the ship, so you won’t get left behind). Better still, gratuities are deducted from the same account at the end of the cruise, so there’s none of the tipping that we Brits find so tricky. After a mandatory emergency drill (including a hilarious waddle back to our rooms in life jackets), the night is ours. A band is playing by the pool so we choose this as our spot to watch, Prosecco in hand, as the ship casts off and Captain Gianmario Sanguineti threads us with great skill out of the packed harbour (passing within a whisker of Roman Abramovich’s superyacht). Hmmm… this is going to be good. After a choppy night (or so we’re told, though Andrew and I slumbered through it) we take breakfast in the Grand Dining Room. This is aptly named, with chandeliers and waiter service, but there’s no dressing up – at least not until dinner. Even then, the code is “country club”, which basically means no shorts (though you won’t be alone if you prefer to glam it up). Breakfast eaten, we find sunbeds by the pool (tip for newbies: don’t be late or they’ll all be taken) and we get talking to a lovely couple who have cruised a few times before. A hundred and thirteen times, to be exact. Later that morning I discover the library – peaceful, cool, well stocked and handy for Baristas coffee bar. Lunch is at the Terrace Grill, a posh burger bar with outside seating, followed by pudding from the ice cream booth (one lady I speak to says she always takes larger clothes for later in the cruise – a useful tip, I fear). After a very chilled afternoon it’s the Captain’s Cocktail Party in the Horizons Bar on Deck 15, and then dinner at Chez Jacques. We’re joined at our table by two doctors from New Jersey and it’s a great evening. Table-sharing doesn’t come naturally to Brits but we were given the option and thought why not? Maybe we were just lucky with our dining partners but we never regretted it. Breakfast at the Terrace Café, then back on the sunbeds to bask in the 80 degree heat (we appreciate it when the staff come round with ice-cold flannels). We skip lunch because we’re saving ourselves for afternoon tea in the Horizons Bar (dainty sandwiches, cakes and scones, served by white-gloved waiters to the sound of the ship’s string quartet. Bliss!). Afterwards I check out the Canyon Ranch SpaClub, which offers a wide range of treatments and talks on all kinds of health issues that we aren’t suffering from yet. For those whose health regime is more energetic, there’s an impressive onboard gym, though not much in the way of exercise classes. After dinner (delicious lobster at the Terrace Café) we check out the casino (buying chips with our onboard credit card) and play roulette. A quick nightcap in the piano bar, then bed. Land ahoy! We anchor for the day at Gustavia. I had pre-booked a snorkelling expedition but that’s not till 1pm, so there’s time to explore this pretty little town of 7,000 inhabitants and take our first swim in the Caribbean. There is a school on the beach, and we can hear children chanting and singing as we bob about in the deliciously warm water. The shopping is said to be good here, too (Riviera has its own shopping expert, Jennifer, who gives a talk every day about the next port and what to buy there). At lunchtime we meet our boat for the snorkelling trip, along with our new friends Monica and Ed. It turns out to be a great couple of hours – I see barracuda, needlefish, angelfish and numerous others I can’t name – though at $89 each it’s perhaps a little expensive. For dinner we have a table booked at the Polo Grill, where our dining companions are Bill – a Vietnam veteran from Texas – and his wife Sheila, and Larry and Glenda from Canada. The food is superb and the conversation flows – so well that we miss tonight’s show. But no matter, we drop by the casino and then head up to Horizons to watch the karaoke. The standard is amazing (some of these people must be pros, surely). As we laugh, sip cocktails and chat to new chums, we feel as though we’ve joined a very exclusive but very welcoming club. Friends had raved about swimming with sea turtles in Barbados, so although this wasn’t listed as an Oceania excursion, I booked independently before we came away. There’s plenty of time before our turtle boat leaves, so we wander around Bridgetown. We’ve clearly got our sealegs now because we’re finding land-based locomotion quite difficult (Andrew is so wobbly on his pins that he has to sit down for a bit). Soon though, we’re back in the sea – courtesy of Captain Kevin and Winston, our expert guide. It’s just the two of us on this expedition but Winston joins us in the water with a bag of turtle food. In no time, three of these beautiful creatures are swimming round us, and my friends aren’t wrong – it’s magical. Back on land there’s still plenty of time before the ship sails so we find a beach and a beach bar and treat ourselves to a raspberry Collins cocktail (or two). Dinner tonight is in the Grand Dining Room – quite as good as any of the speciality restaurants – and afterwards it’s the Riviera Theatre for a brilliant conjuring show. Leaping off zip wires and whizzing through spectacular treetops, we spend an exhilarating, if tiring, morning at Rainforest Adventures. After lunch we head back to the island’s capital, Castries, for a spot of shopping, and we try one of the local bars. It’s a bit intimidating at first, as we are the only visitors – but we order beer, buy a couple of rums for the guys at the bar, and soon we’re chatting like old friends. 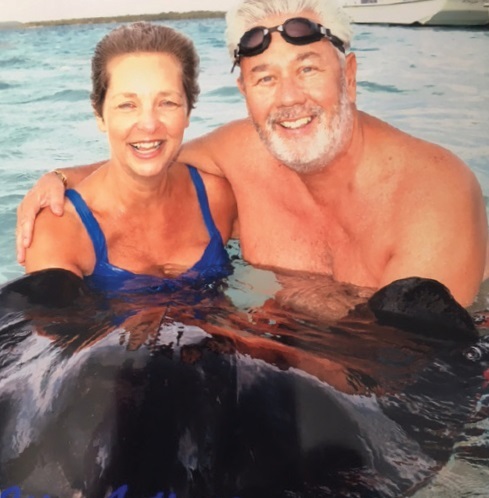 Later that day we speak to a couple of our fellow cruisers – Americans – who’d stayed on the boat because they’d heard St Lucia is too dangerous. We were amazed. What a shame to miss such a great day and the opportunity to meet some fascinating people. That evening I discover that each stateroom deck has a laundrette, so we have an evening “at home”. I put a wash on while Andrew goes down to reception and borrows a film from the ship’s huge DVD library. Docked in St John’s, we take a bus and a speedboat to where the stingrays swim, and after a safety briefing we’re kitted out with snorkelling gear. The stingrays are amazing, and tamely swim up as we feed them with small squid (taking care to avoid their tails, of course). Next we hire a cab to Fort James Beach where, after a delicious lunch at Miller’s By The Sea (and some great Sixties music), we hire sunbeds and have a swim. Dinner tonight is at Toscana. I decide this is my favourite of the ship’s speciality restaurants so far, and I love the Versace plates. We round off our evening by meeting Monica and Ed for a nightcap in the piano bar. Docked at Tortola, we rise early for a climb up Sage Mountain, followed by chilling out at Sugar Cane Beach. This expedition is not for the faint-hearted – one of our party turns back, and another takes a tumble. We can’t even admire the views because it’s raining and the peak is shrouded in cloud. But adversity breeds camaraderie and we all brighten up as we board the open-sided bus to drive down to the beach for another swim among the swooping pelicans and boobies. A lovely day doing very little – not even lunch, as we’re saving ourselves for Red Ginger, the Thai restaurant, tonight. It doesn’t disappoint – my sea bass is just amazing. After dinner we head to the Riviera Theatre for a show called World Beat. This being the last entertainment of the cruise, all the performers file on stage afterwards, as cruise director Shawn thanks us for being a wonderful audience, and we thank them for being just wonderful. It feels quite emotional but there’s no time for tears as there’s a big party in Horizons. We go – and we stay late. It’s our last full day at sea, and Ed and Monica suggest we fill it by doing everything we haven’t already tried. So we take up the challenge: shuffleboard, table tennis and bingo before lunch, then 18 holes of crazy golf and one set of tennis. Finally we enter the Big Quiz in the Riviera Theatre – luckily joining forces with some American friends because the questions have a distinct Stateside spin. We finish our last day with dinner in the Grand Dining Room and a reluctant goodbye to all our favourite crew. Up early, as we’ve been asked to disembark at 8.30 am. 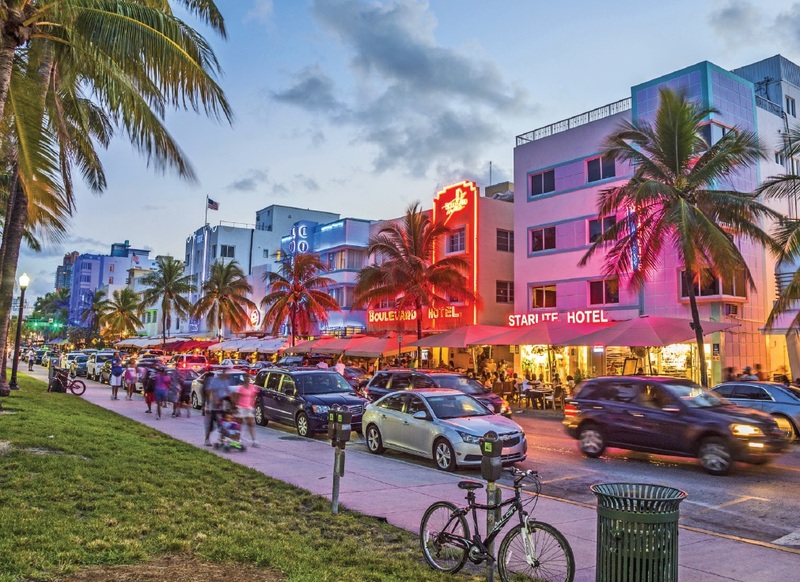 But never mind – that gives us a whole day to explore the wonders of South Beach, before being whisked off to the airport. There’s also time to reflect on our first ever cruise. So what did we think? In two words, we’re hooked. Our holiday turned out to be a superb mix of relaxation, sightseeing, activities, food and drink, people and luxury. Were we too young? Not a bit of it. Admittedly it’s not the kind of cruise you’d bring children on, but for the two of us it was just amazing – as were all the Oceania crew. I can’t wait to see them again.